A very attractive low growing ground cover plant, Pratia pedunculata with its natural trailing habit comes in a number of flower colours. 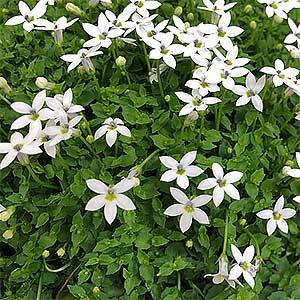 Sometimes called the ‘Star Creeper’, or ‘Common Pratia’, it has excellent green foliage throughout he year with contrasting white to pink or blue flowers from late winter right through spring to summer. Flowering period will depend on the climate. This is a mat forming plant, the foliage is small, rounded and when grown in the garden or in a container it forms a mounded clump. This is a plant sends out runners, and the leaf nodes will send down roots where they make good contact with the soil. The flowers are star shaped and attractive. In a container, Pratia pedunculata will trail gently over the sides as it grows. This can be a frost tender plant, so choose a protected position especially from heavy frosts. It will only reach around 20cms in height however can spread to more than 1 metre over time. The best position is in a humus rich soil, a little moisture, however with good drainage. It is regarded as fast growing, however is very easy to trim to keep it in place. Propagation is easy by division of larger clumps, best carried out in early spring. When newly planted, applications of a liquid seaweed fertiliser will keep the plant looking healthy. You will need to provide additional moisture in dry summer periods. The easiest method of propagation is by division of established clumps, also possible from seed. In some areas this can be an invasive plant as it will spread easily by underground runners. 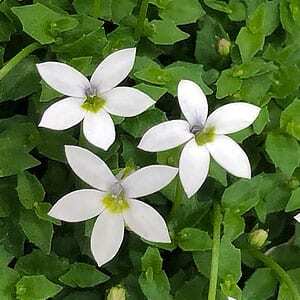 Common Names – Blue Star creeper, White Star creeper. Position – Light shade, morning sun and afternoon shade. Spread – Will Spread to 1 metre and more in good conditions. Foliage – Small, rounded and mid to pale green. Flowers – Blue, Pink or White.